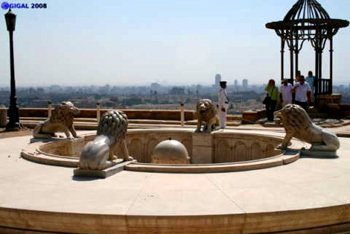 "We are at the top of Saladin's stronghold in Cairo, in front of this fountain surrounded by four lions. Below lies the big city of Al Kahira ("The Victorious", name given to planet Mars; town thus linked to Horus): Cairo, and if you don't look carefully you won't see, straight ahead, in the first picture's background, in very small, two of the pyramids in the mist of Giza's plateau... Just opposite the globe in the fountain. This is not a coincidence. Salah el Din (Saladin) and the tradition of the Arabic alchemists and scholars really were, for some people, the heirs of Ancient Egyptians' knowledge... 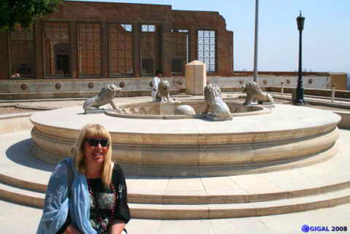 The four lions of the four poles, of the four elements, in front of the inside globe onto the underworld's archways inscribing themselves into several circles (one must see the fountain from far away and whole) indicating the course of other planets... and the copper wheels on the low wall at the back... Don't miss this fountain if you come to Cairo... It shows many things to the one who knows how to observe."